PREMIUM QUALITY Eucalyptus OIL: 100% Pure, Natural, Therapeutic Grade. Steam Distillation of fresh Eucalyptus. Non-Toxin, No Additives, No Fillers, Unfiltered and Undiluted. Vegan certified, paraben free and cruelty free. ELEGANT AMBER BOTTLE + GIFT & TRAVELING PACK + USER GUIDE: Comes with a high quality packaging for Your Convenience when dispensing and a FREE GUIDE of uses & benefits. No Leakage or Dripping. Best value for your money! WORKS OR YOUR MONEY BACK - Our Guarantee: We stand behind our products with 100% Satisfaction Guarantee policy. Try it and if you are not fully satisfied we will refund your purchase! 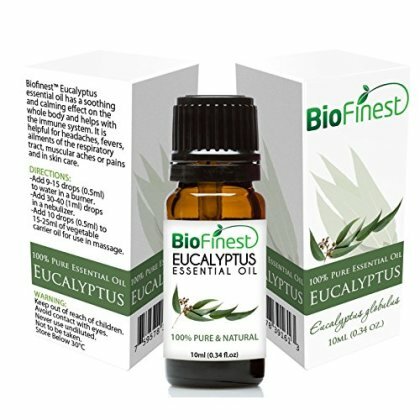 AMAZING AROMATHERAPY EXPEIRENCE- Add a few drops of Biofinest Eucalyptus Oil into your oil diffuser to inhale the ultimate serenity while refreshing the room with the crisp scent of Eucalyptus Oil. This spectacular scent will also open your airway and fill you with an invigorating fresh, renewed feeling. RELIEVE STRESS, DEPRESSION AND ANXIETY: Eucalyptus radiata is cooling, refreshing, and energising. It has a fresh, invigorating aroma that supports normal breathing and soothes tense muscles. Because it is relatively gentle and non-irritating, it is the preferred choice for children.